› Author Affiliations Funding This work was supported by the Swiss National Science Foundation (grant 310030_162567), the Novartis Foundation (grant 15B097) and the Swiss Heart Foundation. Background Platelets are an abundant source of micro-ribonucleic acids (miRNAs) that may play a role in the regulation of platelet function. Some miRNAs, such as miR-126-3p, have been noted as potential biomarkers of platelet reactivity and the recurrence of cardiovascular events. However, the biological relevance of these associations remains uncertain, and the functional validation of candidate miRNAs on human-derived cells is lacking. 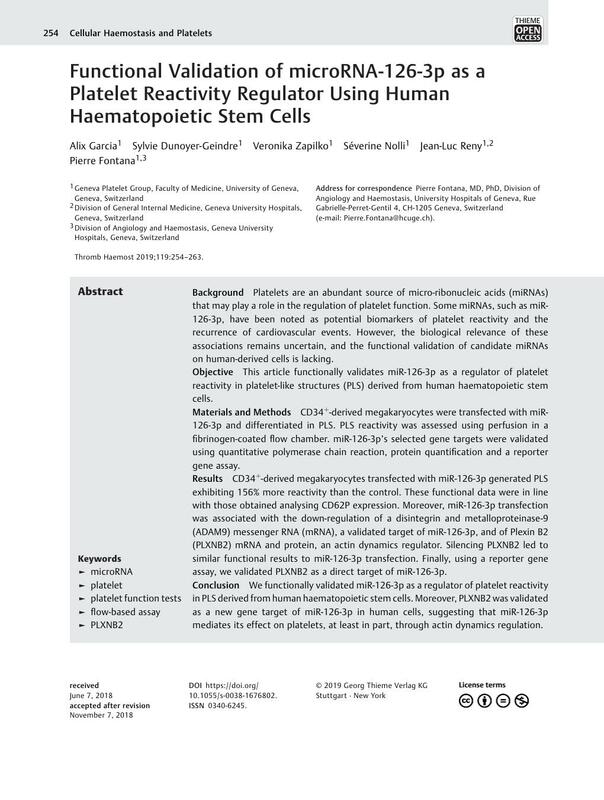 Objective This article functionally validates miR-126-3p as a regulator of platelet reactivity in platelet-like structures (PLS) derived from human haematopoietic stem cells. Materials and Methods CD34+-derived megakaryocytes were transfected with miR-126-3p and differentiated in PLS. PLS reactivity was assessed using perfusion in a fibrinogen-coated flow chamber. miR-126-3p's selected gene targets were validated using quantitative polymerase chain reaction, protein quantification and a reporter gene assay. Results CD34+-derived megakaryocytes transfected with miR-126-3p generated PLS exhibiting 156% more reactivity than the control. These functional data were in line with those obtained analysing CD62P expression. Moreover, miR-126-3p transfection was associated with the down-regulation of a disintegrin and metalloproteinase-9 (ADAM9) messenger RNA (mRNA), a validated target of miR-126-3p, and of Plexin B2 (PLXNB2) mRNA and protein, an actin dynamics regulator. Silencing PLXNB2 led to similar functional results to miR-126-3p transfection. Finally, using a reporter gene assay, we validated PLXNB2 as a direct target of miR-126-3p. Conclusion We functionally validated miR-126-3p as a regulator of platelet reactivity in PLS derived from human haematopoietic stem cells. Moreover, PLXNB2 was validated as a new gene target of miR-126-3p in human cells, suggesting that miR-126-3p mediates its effect on platelets, at least in part, through actin dynamics regulation. A. Garcia, S. Dunoyer-Geindre, J.-L. Reny and P. Fontana designed the study and analysed the data. A. Garcia, S. Dunoyer-Geindre, S. Nolli and V. Zapilko performed the experiments and analysed the data. A. Garcia, S. Dunoyer-Geindre and P. Fontana wrote the first draft of the manuscript, and all authors revised the intellectual content and approved the final version.